The dimples under the legs are casting four shadows and have remarkable light stripes. Mark the flatworms. 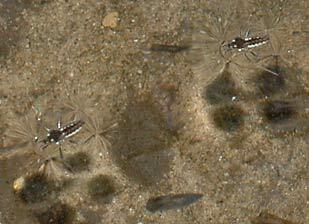 Three pictures of Water crickets, top view. The long middle legs deliver the propulsion. 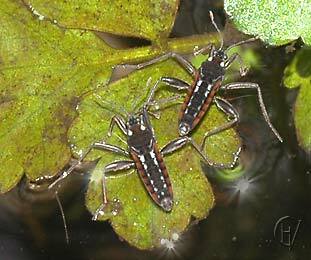 THE Water cricket IS A STOUT SURFACE BUG: HE RUNS ON RAPID STREAMING WATER, SOMETIMES IN MIDWINTER. Water striders are also able to walk on streaming water, some species even prefer this, but the Water cricket can handle more rapid streaming waters. Yet even the Water cricket prefers the more quiet nooks, if the waters get too rushy then even this species leaves. Often they are hidden in the growth of the border and seem disappeared from one day to another. On the brook they stand in small groups like dark spiders, staying put with short jerky rowing movements on the quick water in an amazing way. Every now and then one of them may dive under water, the Water cricket is the only surface bug able to do this. They can also crawl along a water plant to a submerged position. Surrounded by a bubble of air they can stay under for a while. Let's have a closer look at the Water cricket with the pictures on this page, that were all made in the "Sprengendal" (Spring valley) near Ootmarsum, in the Netherlands. On the right: four Water crickets on a stream. If you look closely, you can see that the middle legs are held up like a pair of oars. The front and hind legs are sharply bent backward, the feet like sled irons longitudinal with the body. In this way they have the lowest resistance to the rapid flowing water, they are a bit like skaters who stand still while the ice moves fast under them. The middle legs only touch the surface for short rowing motions (see also the smaller pictures below left). In sufficient light the Water cricket is beautifully marked with white spots on black and a pair of red seams that have pointed ends. Most specimen are wingless, sometimes an individual with wings appears. There are no half winged specimens known. In Europe there is Velia caprai, older name: Velia currens. Further there is Velia saulii which looks very much like the other species. 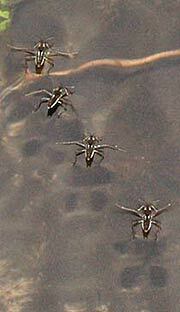 Water crickets feed on insects that have fallen on the water. They can steal on these by ejecting a fluid that spreads quickly over the water surface like camphour and so gives the Water cricket a "silent running". In spring the larva crawl out the eggs and after five instars they are imagos. There is one generation in a year. Water-crickets make no sound, they bare the name just because of their resemblance with a cricket.